What’s up readers, weekly NXT reviews are BACK and BETTER THAN EVER for the leadup to Takeover Brooklyn 4. I’m not going to sugar coat it, it’s been too long since I’ve written a weekly review, and a LOT has happened in that time. The NXT Tag titles changed hands at the Royal Albert Hall, then they changed hands again in a 5 STAR MATCH, Kairi Sane is the #1 Contender for Shayna Baszler’s Women’s championship, The War Raiders are still bein big and nasty, oh and also Tommaso Ciampa won the NXT Championship. It’s a sad world we live in, but that despicable bald scum is the face of the yellow brand. 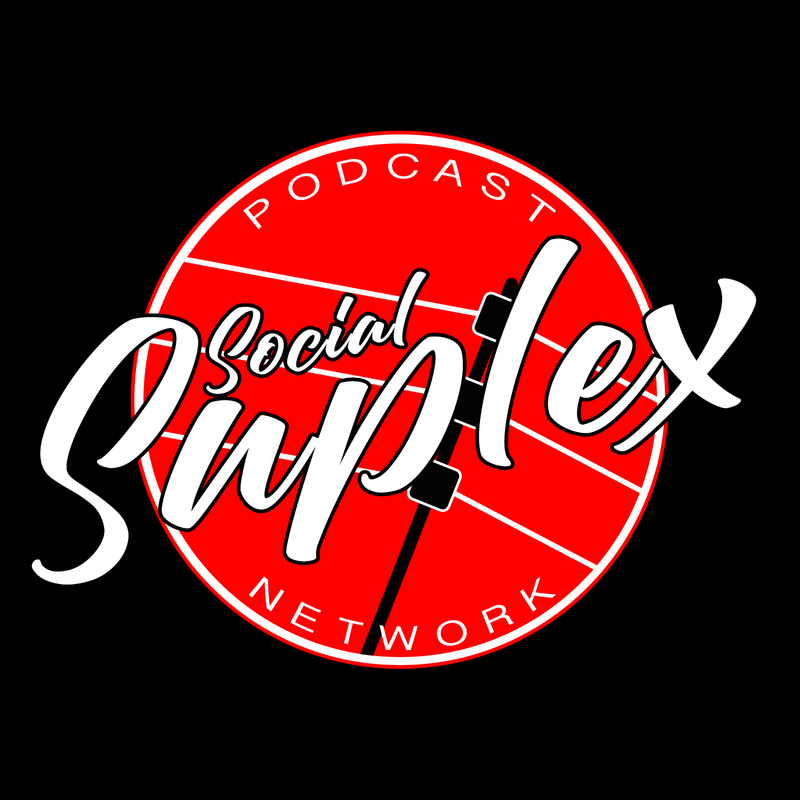 As for this week’s episode, we had 3 matches and a couple of promos, so let’s get into it. This feud has been going on for what seems like a really long time, and to be honest I wouldn’t have minded if this match was the end of it. While I like Heavy Machinery a lot, it’s easy to see that they’re not going to be tag team champs anytime soon. 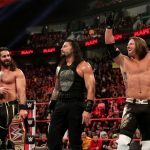 Right now it seems like The Undisputed Era, Mustache Mountain, and The War Raiders are the “big three” in the tag division, but I think The Mighty could be the 4th team. The Street profits and Heavy Machinery, despite being over enough to be tag champs, don’t have the match quality that the teams I mentioned do, and with Oney Lorcan rehabbing a broken orbital bone it’s gonna be a while before we see him and Danny Burch. It’s also important to note that NXT loves their “undersized tag team beats a couple of hosses for the titles” storylines, so The Mighty beating Hanson & Rowe for the titles wouldn’t be out of the question. As far as this match itself, it was one of the better Heavy Machinery matches I’ve seen. Tucker Knight hit a cannonball senton off the apron, and both teams were really working hard to sell the smaller team as heels. The Street Profits ran in and distracted the crowd right as The Mighty got the upper hand, which allowed Heavy Machinery to hit the compactor for the win. I think this will wind up being the last match in the feud, with The Mighty entering a program against the Street Profits. Where that leaves Heavy Machinery I’m not sure. At this point, it’s official that the Takeover the night before survivor series will feature the second War Games match in NXT history. Last week on NXT we saw what I think was a teaser for that war games match. One team, perhaps obviously, will be the Undisputed Era. The group that the first War Games match was booked to get over, and the current holders of the tag team and North American titles, it just makes sense. We saw Adam Cole confront Ricochet last week, and this led to Cole, Kyle O’Reilly and Roderick Strong getting trapped on the entrance ramp between Ricochet and the War Raiders, who I think will be the second team. While Ricochet and the War Raiders have not interacted on tv yet, I think they’ll fill the role that Roderick Strong and the Authors of Pain filled in last year’s War Games match. Finally, when TUE escaped towards a side entrance to full sail, they were greeted by Trent Seven and Tyler Bate. Seven & Bate are 2/3 of what I think will be the third team in War Games, and while I don’t know for sure, I think Pete Dunne will be the third person on that team. 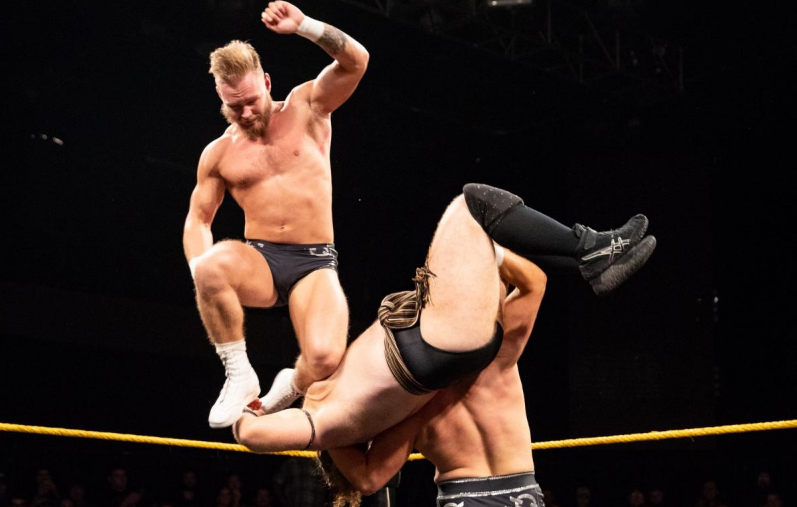 I think this is where NXT finally brings British Strong Style together. We saw a light version of it with Dunne, Lorcan, and Burch, but this time it’ll be the real thing. This could obviously change with the NXT UK show having tapings, perhaps EC3 or The Velveteen Dream take Dunne’s place, but I think it would work better if Dunne is on Mustache Mountain’s team. I say that the tag team match in Brooklyn could go either way because I could see Mustache Mountain using a win in the War Games match to get one last shot at the tag team titles. As the episode rolled on, we got EC3 vs Kona Reeves. The 1 percenter vs the FINEST. 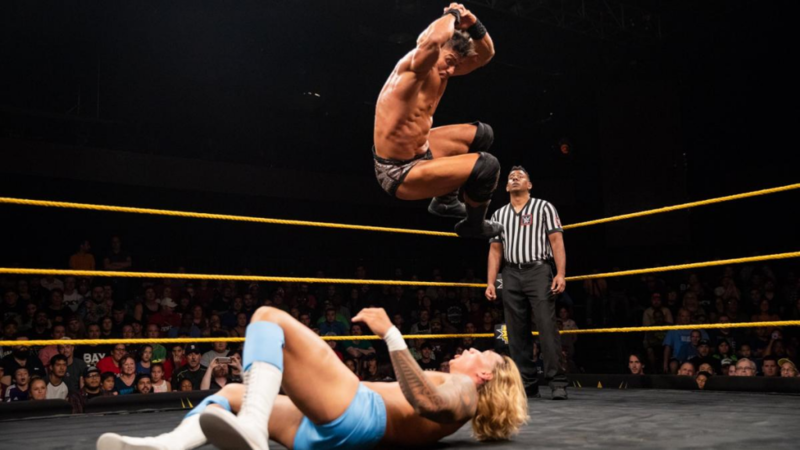 If you know how I feel about Kona Reeves, you know that it’s oddly appropriate for me to make my return to NXT reviews in a week where Kona Reeves wrestled. This week, Kona Reeves’ ring gear looked like when a child dresses themselves for the first time, except this child apparently got way too much money to do so. 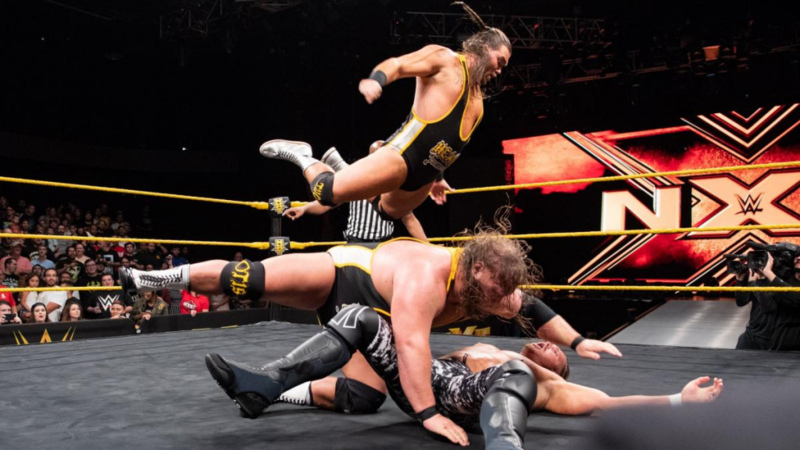 Also, I couldn’t help but notice that Kona Reeves wears his knee pads just below his knees, and that really bugs me. Am I getting worked by dollar store John Morrison? Only time will tell. I’ll admit that his theme music isn’t awful, as much as it hurts to say. EC3 is a funny case because he came into NXT as a heel, but he seems to have turned babyface overnight. I don’t dislike it, because I really like EC3, it’s just funny to see. The Velveteen Dream interrupted this match, although he didn’t interfere in it, and he was wearing quite possibly the longest tie I’ve ever seen. Just a preposterous piece of clothing. Brian Colangelo already has multiple burner accounts defending this tie. The Dream told EC3 they could “talk about” what happened at the Royal Albert Hall, but EC3 would have to come to him. Before he walked off the stage, The Velveteen Dream snapped his fingers to change the titantron from a Velveteen Dream logo back to the NXT logo. This can only mean one thing: The Velveteen Dream has supernatural powers that can control arena technology. Ok maybe it doesn’t mean that, but I’m going to believe it because it’s much more fun to believe. Kona Reeves hit EC3 with a Hawaiian Drop after Dream left, but because he’s Kona Reeves he can’t even get a win via interference. EC3 hit Reeves with the 1% slam (Fireman’s carry cutter) for the win, and he accepted Dream’s invitation to talk in a backstage promo post-match. Next, we got a Mae Young Classic rematch between Candice Lerae and eventual tournament runner-up Shayna Baszler, the current NXT women’s champion. Candice finally seems to be shaking the “Hey guys she’s Gargano’s husband!” label, which makes me happy, even if Baszler did use that to get in her head. This match was really good, and I think it’s time to talk about how much Shayna Baszler has improved since coming to NXT. In both her matches against Ember Moon, Baszler slowed things down and wore her down with submissions. In this match, Candice Lerae got to shine, Shayna Baszler still got her offense in and went over in the end with a sleeper hold. It also highlighted something NXT does 1000 times better than the main roster, because Shayna Baszler, a heel, won without blatantly cheating. Candice Lerae was about to hit a lionsault to finish the match, but Baszler had the presence of mind to roll out of the way. After the match, Kairi Sane came out to stop Shayna Baszler from beating up Candice Lerae, and we got a nice confrontation to further the buildup to Sane vs Baszler. Kairi Sane was wearing a leather jacket, and I think I see more leather jackets on WWE produced tv than anywhere else in the world. It’s going to be interesting to see how Sane vs Baszler 2 gets booked because we’ve seen Kairi Sane beat Shayna Baszler once already. Additionally, I feel like Candice Lerae and Dakota Kai both have more unfinished storylines with Baszler than Kairi does. This leads me to believe Shayna Baszler retains and defends the title in a fatal 4-way at War Games. There’s also an argument to be made that, despite wanting a babyface to win the tournament, the wrong person won the Mae Young Classic finals. I understand that Ember Moon needed a women’s title reign, but would it have been the worst thing for Shayna Baszler to win the title in November and defend it against Ember Moon twice (In Philadelphia and New Orleans)? Ember Moon still gets to be the #1 babyface in the women’s division for a longer time, and Shayna Baszler gets a more logical path to the title. After this segment, we got a nice babyface promo from Mustache Mountain in the parking lot, after which they were confronted by Hanson & Rowe. Hanson & Rowe’s voices sound surprisingly not monstrous, but their promo still came across as menacing. Next, we got William Regal making an appearance. His lordship announced from his office that Adam Cole vs Ricochet and EC3 vs The Velveteen Dream are official for Brooklyn! This was the first time we’d seen Tommaso Ciampa since he won the NXT title, and I have to say, it’s nice to see success didn’t change him. When Kevin Owens won the Universal Title, he went from gym shorts and a cutoff to a suit. 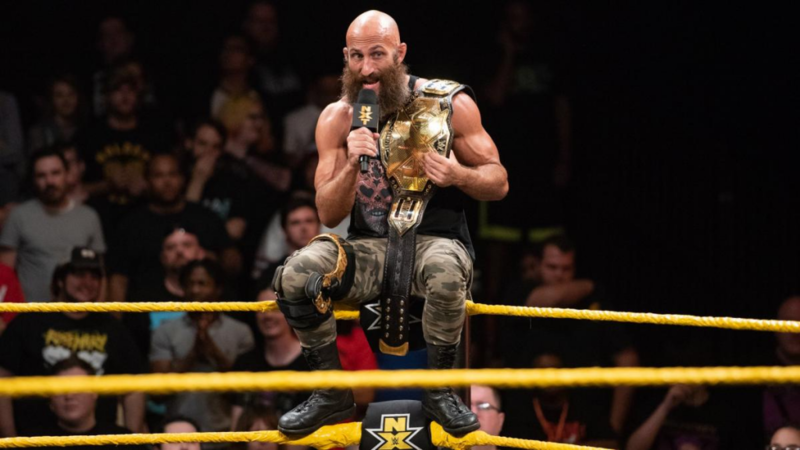 Ciampa won the NXT title and came out in the same camouflage fashion nova for men pants that he’s worn since his return. I think it’s important that we note how good Ciampa has been on the mic during this heel run. Most of the time I just write “Ciampa cut another scathing heel promo” and leave it at that, but the truth is he has played his role perfectly since coming back. Ciampa has managed to cut great promos in the face of more heel heat than anyone on WWE programming has had in recent memory, and that shouldn’t be something we just take for granted. Because when we take great heel work like this for granted, our punishment is trash heel work like Jinder Mahal’s WWE title run. This was a long promo, and Ciampa kept the crowd hot for all of it. We need to recognize that. After Ciampa soaking in the heat for a long long time, Aleister Black’s music hit, and while Black paced out onto the entrance ramp, Johnny Gargano sprinted past him to try and get to Ciampa. 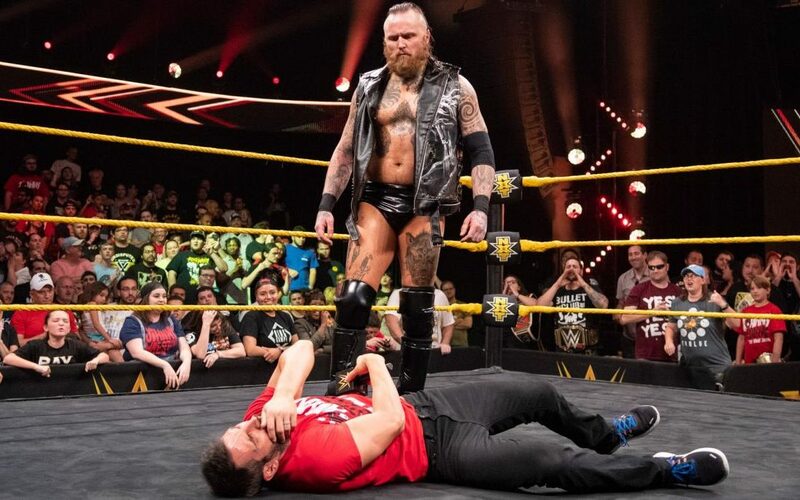 Ciampa ducked out of the ring, Gargano yelled “The only reason you’re NXT champion is because of me!” twice, before Aleister Black hit him with a Black mass out of nowhere. This segment highlighted the brilliant character work that is being done with Johnny Gargano, showing how his obsession with beating Ciampa has gone too far. Additionally, I thought it was a great character moment for Aleister Black. Black has never been one to cut long, wordy promos. Instead, he walks out to the ring calm and silent, and then he kicks people in the face. Black said one thing to close the segment, and that was enough. Next week Keith Lee makes his NXT debut, and if you’re not familiar with Keith Lee you should definitely watch that. Keith Lee is an incredibly nice guy and a tremendous wrestler, I think he’s going to do really well in NXT. Ricochet is also in action next week as if you needed more reason to watch. See you then!